I’ve mentioned recently that writing is a top priority for me. And I came to a great realization during Week 9 to Week 10 as to why… I am documenting all the amazing and adorable things my gorgeous daughter is doing at each age and milestone. I will be able to remember and cherish these things forever. And she can look back some day too and see what she was doing at this age. One of her biggest accomplishments this week was that she started to sleep in longer hunks at night. Prior to our trip to The Fort, the longest she had ever slept was about 4 hours. But then magically, a switch was flipped and we were getting anywhere from 5 hours to 8 hours in a row. (6 ½ hours seems to be the magic number most nights.) Never mind that I have to be the one to put her to bed, instead of Puff, and that she’s sleeping in bed with me in her Boppy instead of her crib. Baby steps. Don’t judge. A few other things I’ve noticed this week… she’s really keen on putting her hands on her bottle when we feed her. It’s like she wants to hold it herself. That, or she’s tired of us taking it out of her mouth to burp her before she’s ready for a break. When we were back in The Fort, we also found out that she can hold her head up really great and likes to be in a sitting position. Her Mamaw handed down a Bumbo seat (yay for saving $45) so we’ve been trying her in that daily for a few minutes. She has some teething beads and a ball that she can get her hands in that she’s been holding pretty well. And immediately trying to take them up to her mouth. She’s gotten them in there a few times. Speaking of things in her mouth, those hands are ALWAYS in her mouth these days. And she does her “hungry face” of sticking out her tongue almost constantly, which throws me because it’s obviously no longer just for hunger. It’s like she discovered her tongue! One time recently, she was doing that face (because she was actually hungry) but then started to laugh while her tongue was out. Cutest. Thing. Ever. She’s been really smiley with us lately too and last Saturday night, her and Puff had a dance party. She was laying on her changing pad and he was singing to her and she was giggling and kicking her legs and arms around. Then she was making different noises that she doesn’t normally make. It’s so cool to watch her discover stuff that she can do herself. Like the day she was mimicking me pouting out her bottom lip. Precious! And we broke down and bought some 3 to 6 months sized clothes for her. 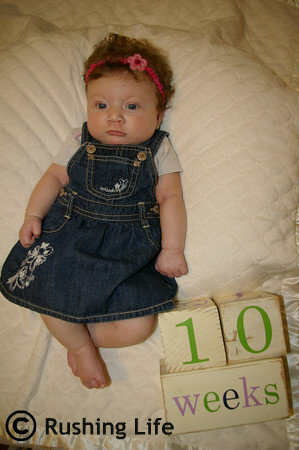 Most of her 0 to 3 months onesies are still OK, but she’s really almost too long for most of her sleepers. Except I hate that the next size up is so much longer that she’s got too much extra fabric. Although after we bought her the new stuff (which includes an owl onesie, an owl sleeper, a hedgehog sleeper, and a onesie with a pink big wheel on it) I did the math and realized she already has about 10 sleepers in that size and about 15 onesies. Whoopsies! This girl has too many darn clothes!